The most exciting game was a derby match between two local teams from Beirut: Al Riyadi (#1) and Hoops Club (#6). Al Riyadi (9-1) crushed visiting Hoops Club (3-6) by 34 points 119-85. It ended at the same time the two-game winning streak of Hoops Club. Al Riyadi shot 60.6 percent from the field and made 19-of-24 free shots (79.2 percent) during the game. They looked well-organized offensively handing out 33 assists. The former international guard Amir Saoud (186-91) orchestrated the victory by scoring 20 points, 7 assists and 4 steals. Forward Hayk Gyokchyan (203-90, college: Franklin & Marshall) contributed with 21 points and 5 rebounds for the winners. American point guard Willie Warren (193-89, college: Oklahoma) answered with 24 points and 4 assists for Hoops Club. The winner was already known earlier in the game, so both coaches allowed to play the bench players saving starting five for next games. Al Riyadi have a solid series of four victories in a row. They maintain first place with 9-1 record. Newly promoted Hoops Club keeps the sixth position with six games lost. They share it with Moutahed. The game in Byblos was also worth to mention about. Third ranked Homentmen (7-2) played at the court of 5th ranked Byblos (4-6). Homentmen managed to secure a 8-point victory 103-95. It was a great evening for U.S. Virgin Islands-Puerto Rican point guard Walter Hodge (183-86, college: Florida) who led his team to a victory with a double-double by scoring 29 points, 6 rebounds and 10 assists (was perfect 9-for-9 from the free throw line !!!). Michael Efevberha helped adding 27 points and 6 rebounds. American forward Aaron Nelson (205-91, college: S.Indiana) responded with a double-double by scoring 26 points and 13 rebounds. Defending champion maintains third place with 7-2 record having just three points less than leader Al Riyadi. Byblos at the other side keep the fifth position with six games lost. In the last game of round 11 Champville smashed Sagesse on the road 99-66. The game in Byblos was also worth to mention about. Third ranked Homentmen (7-2) played at the court of 5th ranked Byblos (4-6). Homentmen managed to secure a 8-point victory 103-95. Homentmen shot the lights out from three nailing 14 long-distance shots on high 51.9 percentage. Their players were unselfish on offense dishing 22 assists. It was a great evening for U.S. Virgin Islands-Puerto Rican point guard Walter Hodge (183-86, college: Florida) who led his team to a victory with a double-double by scoring 29 points, 6 rebounds and 10 assists (was perfect 9-for-9 from the free throw line !!!). Nigerian-American guard Michael Efevberha (193-84, college: CS Northridge, agency: Octagon Europe) helped adding 27 points and 6 rebounds. 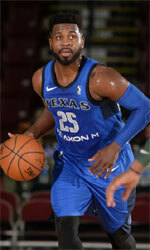 American forward Aaron Nelson (205-91, college: S.Indiana) responded with a double-double by scoring 26 points and 13 rebounds and the other American import forward Malcolm Riley (196-93, college: Texas Southern) scored 23 points and 5 rebounds. 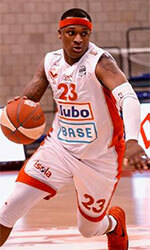 Four Homentmen and five Byblos players scored in double figures. Defending champion maintains third place with 7-2 record having just three points less than leader Al Riyadi. Byblos at the other side keep the fifth position with six games lost. No shocking result in a game when second ranked Champville (8-2) crushed bottom-ranked Sagesse (1-8) in Beirut 99-66. Champville dominated down low during the game scoring 62 of its points in the paint compared to Sagesse's 34. Champville forced 25 Sagesse turnovers. Their players were unselfish on offense dishing 25 assists. It was a great evening for American forward Dewayne Jackson (203-90, college: Morgan St., agency: Higher Vision Sports) who led his team to a victory scoring 24 points, 8 rebounds, 5 assists and 5 steals. The former international forward Fadi El-Khatib (198-79) helped adding 20 points and 6 rebounds. Four Champville players scored in double figures. Champville's coach Fuad Abou Chakra felt very confident that he used 11 players which allowed the starters a little rest for the next games. Canadian power forward Keanau Post (211-92, college: Missouri) responded with a double-double by scoring 16 points and 16 rebounds and Aziz Abdel-Massih scored 22 points. Champville have an impressive series of five victories in a row. They maintain second place with 8-2 record behind leader Al Riyadi. Sagesse lost seventh consecutive game. They stay at the bottom position with eight games lost. The most exciting game was a derby match between two local teams from Beirut: Al Riyadi (#1) and Hoops Club (#6). Al Riyadi (9-1) crushed visiting Hoops Club (3-6) by 34 points 119-85. It ended at the same time the two-game winning streak of Hoops Club. Al Riyadi shot 60.6 percent from the field and made 19-of-24 free shots (79.2 percent) during the game. They looked well-organized offensively handing out 33 assists. The former international guard Amir Saoud (186-91) orchestrated the victory by scoring 20 points, 7 assists and 4 steals. Forward Hayk Gyokchyan (203-90, college: Franklin & Marshall) contributed with 21 points and 5 rebounds for the winners. Four Al Riyadi players scored in double figures. American point guard Willie Warren (193-89, college: Oklahoma) answered with 24 points and 4 assists and Senegalese forward Ibrahima Thomas (213-87, college: Cincinnati) added 17 points and 6 rebounds in the effort for Hoops Club. The winner was already known earlier in the game, so both coaches allowed to play the bench players saving starting five for next games. Al Riyadi have a solid series of four victories in a row. They maintain first place with 9-1 record. Newly promoted Hoops Club keeps the sixth position with six games lost. They share it with Moutahed.